Sgt McWhinney (also known as McWheeney) volunteered as a sharpshooter at the commencement of the siege of Sebastopol and was in charge of the party of the 44th, was always vigilant and active and signalised himself on the 26th October 1854 when one of the party, Private John Keane, was dangerously wounded in the Woronzoff Road. At the time the sharp shooters were repulsed from the quarries by overwhelming numbers. Sergeant McWhinney, on his return, took the wounded man on his back and brought him to a place of safety. This was under very heavy fire. He was also the means of saving the life of Corporal John Courtenay. This man was one of the sharpshooters and was severely wounded in the head on 5 December 1854. Sgt McWhinney brought him from under fire and dug up a slight cover with his bayonet where the two remained until after dark when they retired. Sergeant Whiney volunteered for the advance guard in the cemetery on 18th June 1855 and was never absent from duty during the war. 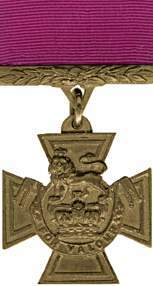 The VC was presented to Sgt McWhinney personally by Queen Victoria on 17 June 1857. The VC is held at the Essex Regiment Museum. This website is made available free of charge with the costs recovered through an advertising agreement. The website does control or ensorse any advertising on the site. Unless otherwise stated all text and images are Copyright © 2016 Marshland(Essex) All Rights Reserved.